Welcome to the EUPEDIA FORUM. I am learning a lot from this forum. I now know that all European have different combinations from WHG (the "European ancestors"), EEF (Anatolian farmers, which are the biggest share, especially on the European South) and ANE (which, if I understand correctly, means also "Yamnaya"). Loschbour man, being a WHG, was dark skinned, dark hair, with blue eyes. The Yamnaya, as I have read, where with dark hair, brown eyes, and a tad darker skin than the average current European (despite coming from the Pontic Steppe). ANE had, apparently, a Native American look. And the EEF possibly looked similar to current Western South Europeans, since current Western South Europeans have a huge share of EEF. So, EEF were also probably with dark hair, brown eyes and not-too-light skin. Of course, both explanations might be true at the same time. Now, my question: could it be that "light" traits became more attractive on the European North, because WHG and ANE were not very attractive to start with? I see in this forum that "gracile Mediterraneans" (which I guess are close to EEF) are considered to be quite attractive. So, then the advantage of becoming "lighter" to be more attractive would be marginally less advantageous in the European South. But if in the North, WHG + ANE Europeans were considered by their peers as "ugly", could it be that a lightening became advantageous then? In general, my question is if there is more or less a consensus about which of the two explanations for "fairness" is more important than the other. I find it more likely that blond hair and light eyes rose to modern frequencies because the production of melanin is metabolically expensive. The degree of melanogenesis is dependant on copper for instance, and other trace minerals like zinc and manganese might be involved in the dark pigmentation of hair as well. Generally speaking, human adaptation to northern climes came with many compromises in evolutionary terms. I do not believe sexual selection had much to do with it. For one, men probably don't discriminate so strongly for hair or eye color to become a significant factor. Then there's the fact that latitude is the strongest correlate of depigmentation in Europe. As for skin color I think the differences in Europe are rather small. About skin color I completely agree: despite being tanned in summer, for example, my skin color behind the bathing trousers is very white and pale. The contrast is outstanding. Possibly the difference among Europeans is not so much the underlying skin color, but the capacity to become tanned. About latitude: yes, but as described, the gradient could also be explained by EEF proportion (maybe farmer techniques from Near East only work in the South of Europe; maybe EEF were attractive enough). The farmers in the north became increasingly depigmented as well, and it seems like HG admixture temporarily lead to darker pigmentation. The farmers from northern Spain have strongly inflated HG ancestry and they're much darker than their eastern relatives. It is a good idea to look at other animals when it comes to questions like this - there is no need to invoke convoluted explanations just because we're talking about humans. The most depigmented species tend to be cave dwellers who tend to live in complete darkness. They lose their color because it serves no function and because pigmentation comes at a significant cost. I think it would be very interesting if we had the phenotypes of WHG, EHG, Lev_Neo, Iran_Neo. I remember David Reich said that these are the original population ingredients of what we now call "White People". The difference between each of the population was as huge as East Asians and Europeans today , so I guess they would have looked very different to each other. WHG(Cheddar Man) is the only one where we have a full reconstruction IIRC. Maybe the increasing prevalence of fair skin had to do primarily with health. Adaptation to northern climes led people to gradually become paler. Those who did so first, with vitamin D better fixed, were probably "stronger", in that they stood better chances of surviving periods of disease and, more importantly, food scarcity. Over time, that advantage may have made a selective difference. I am not sure sexual selection is to be discounted categorically, precisely because fair skin may have "subconsciously" implied better health under cloudy skies. Have a look at this. Go to 19:19. Very true. You can see the pigmentation of the Hungarian Neolithic here. It's lighter than that of the Iberian Neolithic, and by the time of Neolithic 7 and Copper Age 1, they actually have the full, modern complement of skin de-pigmentation snps and lighter hair paired with light eyes is also showing up. The Bronze Age people have the skin de-pigmentation, but in these samples, at least, had dark hair and eyes. That makes sense given that the Yamnaya and Catacomb samples were darker. I still think it's the combination of latitude and the Neolithic diet, which was very low in Vitamin D. They made a big mistake with so many of them eschewing fish. For skin color that's definiely a valid explanation. I do not think that light eyes and hair confer any advantage in cold climates however. The only place outside West Eurasia with prevalent blondism is tropical-humid. I still think that the farming diet was only a trigger to expand the prevalence of fair features instead of the reason fair features came to be. How all those genes came to be and are working together is still a big mystery. On a large scale, people have already some genes associated with fair features long back in time. One Iberomaurusian woman have one allele for Red hairs. Afontova Gora 3 had 1 allele for Blond hairs, we would probably found those allele everywhere in Eurasian related ancestry until it was trigger by something specific. Anatolian and Balkans Neolithic already had those, so if Farming is one of the trigger, it is independant of latitudes. As for Blondism in Melanesia, we need to remember that Melanesians, Papuans and some Australian aborigines have it, so it's not the results of the isolation of Melanesians, but an inherited traits coming from maybe when they were not already very differentiate. Homo Denisova? On the behalf of that last point on Oceanians, there is an old paper related and already posted on Eupedia " Ancient Genomics Reveals Four Prehistoric Migrations into Southeast Asia ". One of the conclusion is that Negritos from Malaysia, Andamanese and Philipinos dont have the Denisovan ancestry found in the Papuans and related. From what I've read, the EHG population was lighter in skin color than the others. They moved into Scandinavia and mixed with the dark WHG at the end of the ice age. You'd expect that would yield a population darker than the EHG, but instead there was further selection for light skin. Resulting in todays Scandinavia look, lighter than even the EHG. My personal theory: Inuit are an example of a population that live at high latitudes, but get large amounts of vitamin D from a marine diet. So little pressure for optimizing for sunlight absorption. With the end of the Ice Age, the WHG/EHG mixed populations sustenance strategy must have changed, perhaps away from a marine base. As more inland areas and food resources opened up, D-vitamin from food sources may have dropped dramatically, resulting in selective advantages for the individuals who could take advantage of sunlight. Actually, according to this paper, the blue eyes allele has shown a extreme and persistent north - south gradient in allele frequency that has been persistent through the last 8 000 years, leading to speculations that it may be advantageous in the north and disadvantageous in the south. We do not know why though. Johannes Krausse said in this video that farming societies (EEF) moving north was the reason why the skin colour got pale. Like Angela said it was due to the farming diet which was low in vitamin d and also because living in high latitudes. I'm afraid my German isn't good for much, certainly not up to the video. Farming came to the southern end of Scandinavia about 4 000 BC. From everything I've read, the selection for light skin in the SHGs started much earlier. Light skin/blue eyes seem to be present at high frequency in Motala thousands of years before farming arrived. Selection must have been ongoing for some time before that. It doesn't seem intuitive that it could be related to a farming diet that wouldn't arrive in the area until thousands of years later. I'd think a starting point related to the massive change in diet resulting from the mainland no longer being under miles of ice, and resultant shift away from marine foods high in vitamin D fits the timing far better. Mesolithic Scandinavians were already light skinned with red and blonde hair. I dont think theres any proof of WHG-proper living in Scandinavia. The hunter-gatherers living in Scandinavia were a mixture of WHG and EHG. To the best of my recollection it was something like 80/20, but even if a snp comes from minority ancestry if it is very beneficial selection will act on it pretty quickly relatively speaking. They got the blue eyes from the WHG, and the snps for pale skin from the EHG. The EHG did not originally have blue eyes. I believe the samples we have all had brown hair and brown eyes. 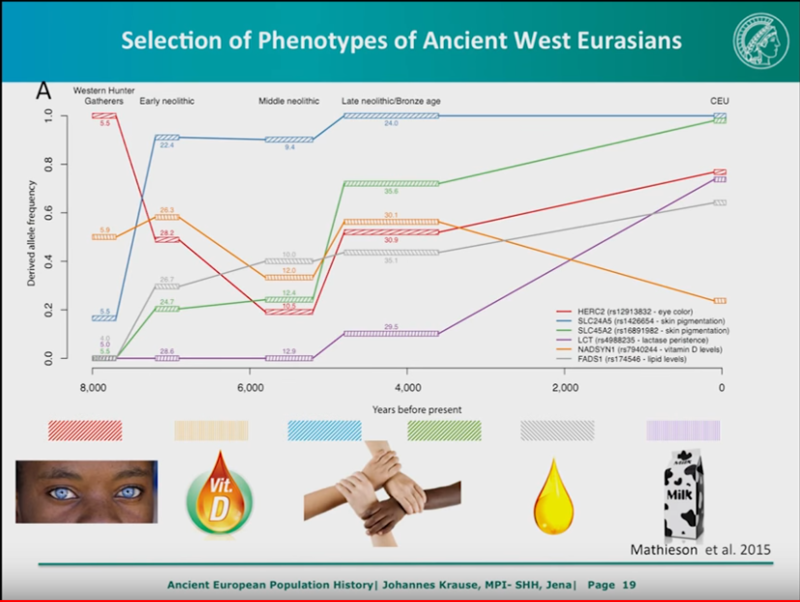 If my recollection serves, at the same time that some, but not all, of the SHG had a percentage of light skinned people, there were also people in Neolithic Anatolia who had de-pigmentation snps. In fact, as Markod mentioned, the farmers darkened a bit after admixture with the WHG. In fact, the CHG sample, which is very old, carried one of the major de-pigmentation snps. I don't think even the scientists totally understand the "source", but if I had to speculate I would say that perhaps for SLC24A5 the Caucasus highlands where the de-pigmented version is found in CHG might be an option. That would explain the radiation both north and southwest into Anatolia. After all, we now know that the EHG were up to 20% CHG. That ydna J in Karelia was a clue. I don't know about SLC42A5. Perhaps that mutation occurred elsewhere. As for blue eyes, a very old study which I can't find right now but which I think is in Jean Manco's book also traced it to the Caucasus, but CHG didn't have them, which is a contraindication. I know there's been a lot of speculation that blue eyes are perhaps linked to low light and northern latitudes, but nothing definitive has been written. One has to consider that if it is northern latitudes, why didn't northern East Asians develop them? They developed their own skin lightening snps after all. Blonde hair can't be related to northern latitudes. It exists in tropical locales, although, I think, with a different set of snps. The three traits were not always linked, and indeed aren't necessarily linked today. The Eskimos aren't all that dark to begin with because they probably carry the same skin lightening snps that Amerindians carry, and which they picked up along with their East Asian ancestry. They wouldn't get any fairer probably indeed because of their diet, as Gnarl mentioned. It contains references to a lot of the literature on the subject. This is where we discussed the paper on the Amerindians. 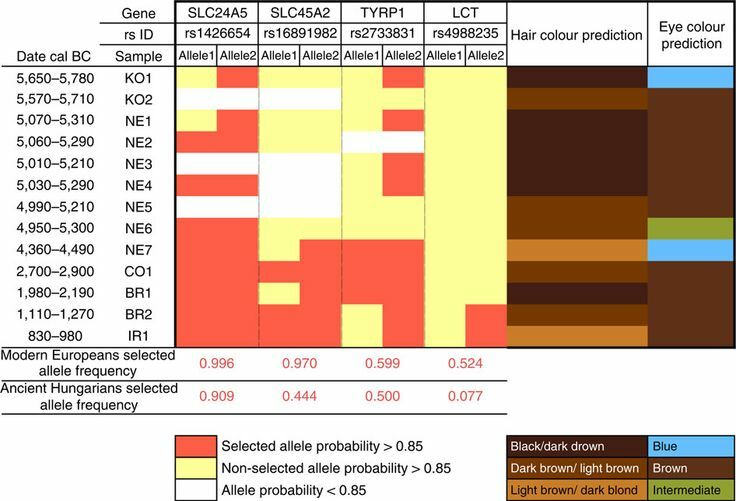 Even with the snps, you can see selection operating on skin color because the Northern Amerindians are fairer than the ones in the Amazon, for example. krause as always. again saying all people in europe had 0% light skin alleles and that they all where looking like the black guy at the beginning and mabe even darker. then he says europeans have only little connection to those people but afterwards he addresses those hgs as "we" europeans. well he is right that we are more anatolians than european but a bit more facts would have been better. here are some bits from the discussion after his presentation. black guy:"sooo johannes, eh...this provocates some questions...eh...but..eh when mobility and migration are completely normal in europe can we say that europeans are a really mixed people and also the germans, really mixed?" krause"....between eurasia and africa there was so much mixing. we had middle eastern people migrating down to south africa...these migrations always brought innovations." "so doi understand that migration was always there and that it was good and brought innovasions so why do people have fear?" krause something like"humans might have group dynamics maybe because of evolution"
"might people in europe look like me in 200 years?" krause "no the phenotype might shift a bit in europe but humans now take selection into their own hands.... they now have genetic tools to manipulate their genome and the designer baby will become reality in the future. the question will be what phenotypes will be favoured. not only genes tied to sickness will be changed but all genes. i'm science fiction fan so i might dream too much about such utopies. the next stage of evolution is not natural but artificial." "humans now take selection into their own hands" k.
Last edited by Ailchu; 07-02-19 at 01:07. Snapshot from the Krause video I posted upthread. It shows the sudden changes in skin and eye color, lactase persistence, and vitamin D levels as new populations came in. it was due to the farming diet which was low in vitamin d and also because living in high latitudes. Seemed to be very logical. But the problem is anatolian farmer who had very high levels of 2 light skin genes than the other farmers. In their environment of west asia, they didn’t need to take vitamin D and their skins should not become to have lighter skin. Another problem is european white skin has the 20 times higher risk to get skin cancer than black skin. So I think it did not happen by adaptation to environment. So modern scientist researchs east asian skin with the low risk to skin cancer. That doesn't mean those traits came from the steppe. 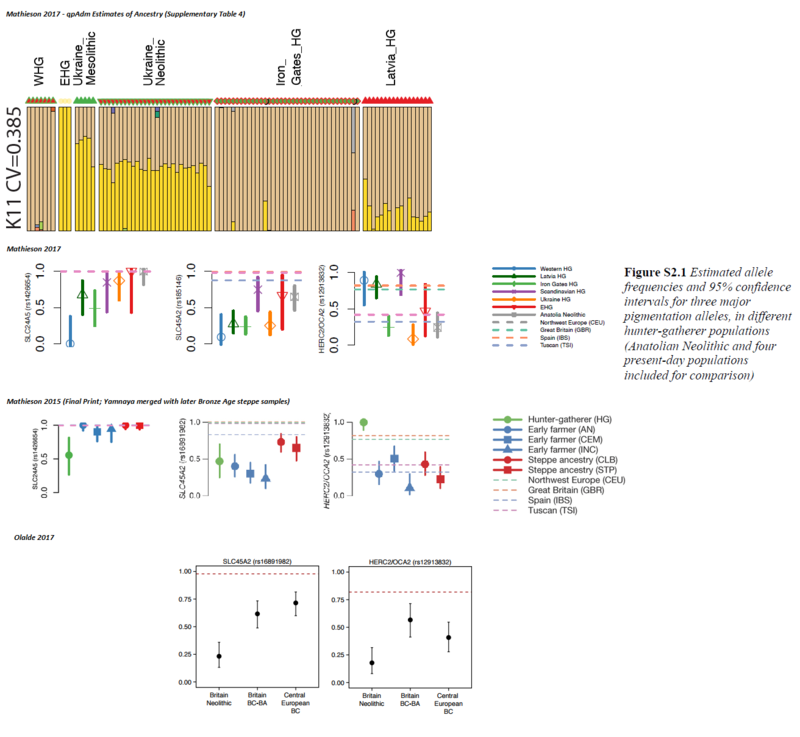 The steppe people, for example, did not have lactase persistence. They also weren't blonde and blue-eyed, not the ones from Yamnaya and Catacomb. That's only true for some Andronovo type people more than a thousand years later, who probably picked up those traits in Central Europe. The "new people" who spread all over Europe were 40-50% European farmer. They were a mix of the two groups. You cannot judge the appearance of the Anatolian farmers by looking at modern people from Turkey. There's been a lot of admixture since then. As we've explained many times, the farmers actually got a bit darker when they mixed with the WHG in Europe. ALL Eurasians have de-pigmentation snps since they left Africa: KITLG, ASIP, various versions of OCA2, and on and on. The further you are from the Equator the more of them you have. Anatolia is NOT East Africa in terms of solar radiation. The Anatolian farmers had a completely different diet from the WHG. There was very little Vitamin D in it. Did the Anatolian farmers have the skin pigmentation of the modern Irish? Probably not, but you can't look at modern Turks for a clue. There's been a lot of admixture since then. East Asians have been studied. They underwent convergent evolution for paler skin, although not as pale as that of the palest Europeans, with their own depigmentation snps. I provided links to the relevant papers. Maybe this is easier to understand. That graphic from Mathiesen et al is very confusing. He has combined WHG and SHG and EHG, and combined different "steppe" groups. It's very unhelpful. You have to check the pigmentation alleles of each specific group. I mean blue eyes and blond hair are definitely associated with latitude in Europe. However I'm not convinced that this is necessarily due to cold climate adaptation. The actual causative factor might be food scarcity, increased energy demands etc. . There are some interesting studies suggesting that in species with phenotypic variance specimens with dark pelage have slightly worse health for example. - Blue eye percentages plummet from 100% before the arrival of the farmers down to around 20% immediately after their arrival. Nothing new there. Then the rates abruptly rocket to around 50% in the course of the 3rd millenium BC. Too late for WHG resurgence. But strikingly coeval with CWC and/or BB (who, incidentally, may have picked extra levels of WHG from pockets of I1 and I2a they met on the way, in Poland and northern Germany, where farming must have been less successful). - SLC24A5 rockets from about 18% to 90% when the farmers move in, then gets a renewed, less spectacular boost after 3000 BC. - SLC45A2 rises from 0 to 20% when the farmers arrive, then shoots up to 70% post 3000 BC. After which it goes on rising to little by little catch up with SLC24A5. - Lactase persistence remains unchanged with the farmers and rises very moderately, but still perceptibly, after 3000 BC. The graph suggests something rather like the triggering off of a process that will gradually and steadily consolidate over time, to reach present-day levels. --- In terms of skin depigmentation, I think what we can infer from the graph is that the farmers did most of the job, but only some of them had both light skin alleles. They brought very high levels of SLC24A5, but were poor in SLC45A2. The steppe people ("somewhat darker than the farmers") didn't have high percentages of people with both alleles either, but brought in the levels of SLC45A2 that somehow completed the job. Last edited by hrvclv; 07-02-19 at 01:18. 0 out of 2 members found this post helpful. Blond hair comes from the steppe. The oldest remains with blond hair SNPs are Afontova Gora 3, from near Mongolia. Steppe admixture in Europeans correlates with the spread of blond hair; and the Samara man from the steppe (who is the true ancestor of Europeans, not Yamnaya) was indeed phenotypically blond. The derived allele of the KITLG SNP rs12821256 that is associated with � and likely causal for � blond hair in Europeans [4,5] is present in one hunter-gatherer from each of Samara, Motala and Ukraine (I0124, I0014 and I1763), as well as several later individuals with Steppe ancestry. Since the allele is found in populations with EHG but not WHG ancestry, it suggests that its origin is in the Ancient North Eurasian (ANE) population. Consistent with this, we observe that earliest known individual with the derived allele is the [Siberian] ANE individual Afontova Gora 3 which is directly dated to 16130-15749 cal BCE (14710�60 BP, MAMS-27186: a previously unpublished date that we newly report here). OP: ANE did not look Amerindian skeletally or phenotypically, you sound like you got your info off a Wikipedia screed or something. Amerindians get part of their looks from their East Eurasian ancestry, which the Ancient North Eurasians from Afontova Gora did not have, much less Yamnaya. Blond hair comes from the steppe. The oldest remains with blond hair SNPs are Afontova Gora 3, from near Mongolia. Steppe admixture in Europeans correlates with the spread of blond hair; and the Samara man (who is the true ancestor of Europeans, not Yamnaya) was indeed phenotypically blond. OP: ANE did not look Amerindian skeletally or phenotypically, you sounds like she got her info off a Wikipedia screed or something. Amerindians get part of their looks from their East Eurasian ancestry which the Ancient North Eurasians from Afontova Gora did not have, much less Yamnaya. I don't know how many times I have to tell people to go back and read up on pigmentation. Pigmentation is a multi allele trait. ONE snp doesn't allow you to predict anything. USE THE SEARCH ENGINE. It's irrelevant what snps Afontova Gora carried, or older steppe groups, for that matter. What is at issue with the question of whether the "STEPPE" people (Pontic Caspian steppe people like Yamnaya and Catacomb, i.e. the original Indo-Europeans) brought blonde hair to Europe further west is whether the steppe people carried traits associated with blonde hair. They didn't. Forensic calculators used all their snps and the prediction is dark hair and dark eyes. They weren't even particularly fair skinned. The papers are clear. Those are the facts whether you like it or not. Honestly, some of you people make many of our threads unreadable. Samara was pre-R1b-M478. Not a very successful lineage. All times are GMT +2. The time now is 22:55.